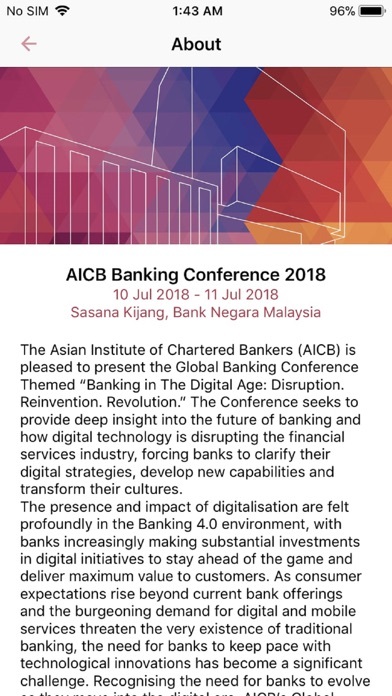 The Asian Institute of Chartered Bankers (AICB) is pleased to present the Global Banking Conference Themed “Banking in The Digital Age: Disruption. Reinvention. 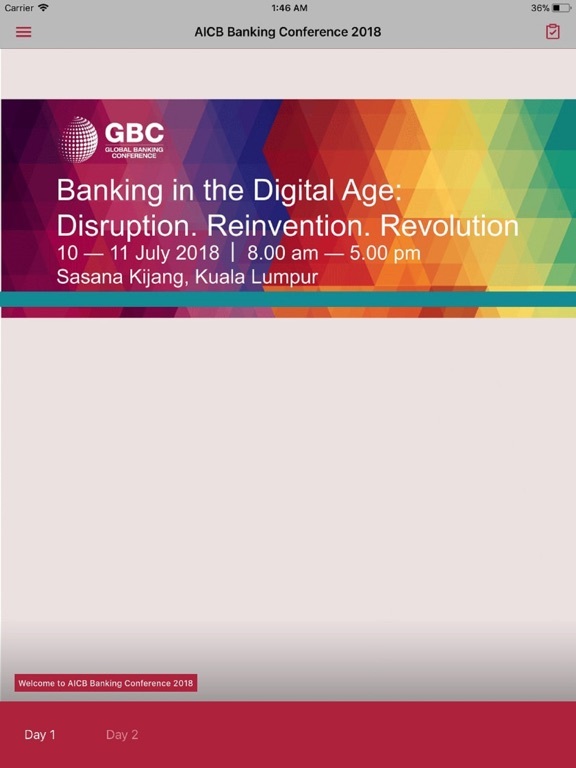 Revolution.” The Conference seeks to provide deep insight into the future of banking and how digital technology is disrupting the financial services industry, forcing banks to clarify their digital strategies, develop new capabilities and transform their cultures. The presence and impact of digitalisation are felt profoundly in the Banking 4.0 environment, with banks increasingly making substantial investments in digital initiatives to stay ahead of the game and deliver maximum value to customers. As consumer expectations rise beyond current bank offerings and the burgeoning demand for digital and mobile services threaten the very existence of traditional banking, the need for banks to keep pace with technological innovations has become a significant challenge. 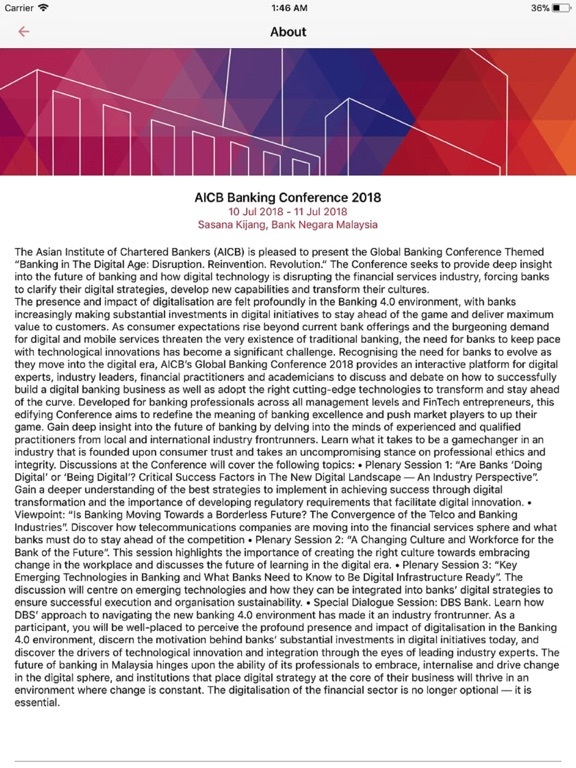 Recognising the need for banks to evolve as they move into the digital era, AICB’s Global Banking Conference 2018 provides an interactive platform for digital experts, industry leaders, financial practitioners and academicians to discuss and debate on how to successfully build a digital banking business as well as adopt the right cutting-edge technologies to transform and stay ahead of the curve. Developed for banking professionals across all management levels and FinTech entrepreneurs, this edifying Conference aims to redefine the meaning of banking excellence and push market players to up their game. Gain deep insight into the future of banking by delving into the minds of experienced and qualified practitioners from local and international industry frontrunners. Learn what it takes to be a gamechanger in an industry that is founded upon consumer trust and takes an uncompromising stance on professional ethics and integrity. Discussions at the Conference will cover the following topics: • Plenary Session 1: “Are Banks ‘Doing Digital’ or ‘Being Digital’? Critical Success Factors in The New Digital Landscape — An Industry Perspective”. Gain a deeper understanding of the best strategies to implement in achieving success through digital transformation and the importance of developing regulatory requirements that facilitate digital innovation. • Viewpoint: “Is Banking Moving Towards a Borderless Future? 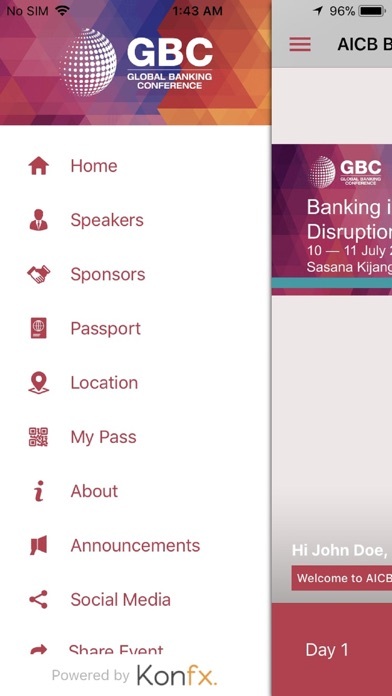 The Convergence of the Telco and Banking Industries”. Discover how telecommunications companies are moving into the financial services sphere and what banks must do to stay ahead of the competition • Plenary Session 2: “A Changing Culture and Workforce for the Bank of the Future”. This session highlights the importance of creating the right culture towards embracing change in the workplace and discusses the future of learning in the digital era. • Plenary Session 3: “Key Emerging Technologies in Banking and What Banks Need to Know to Be Digital Infrastructure Ready”. The discussion will centre on emerging technologies and how they can be integrated into banks’ digital strategies to ensure successful execution and organisation sustainability. • Special Dialogue Session: DBS Bank. Learn how DBS’ approach to navigating the new banking 4.0 environment has made it an industry frontrunner. 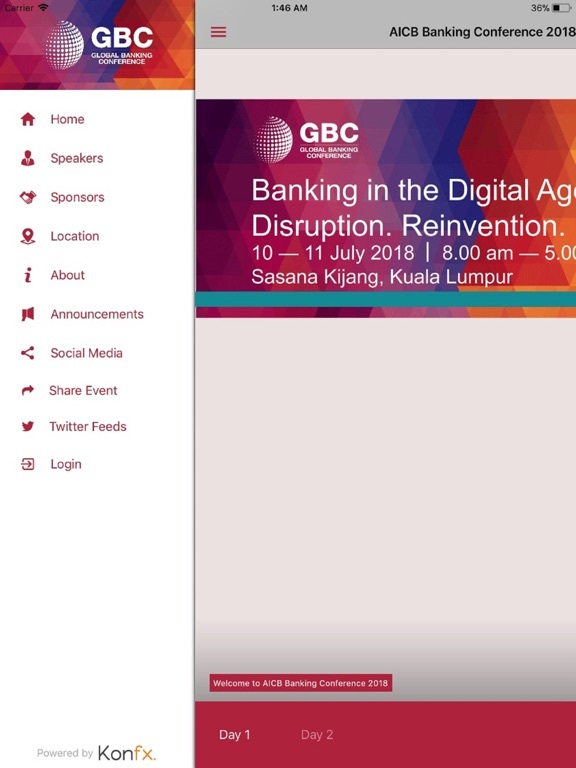 As a participant, you will be well-placed to perceive the profound presence and impact of digitalisation in the Banking 4.0 environment, discern the motivation behind banks’ substantial investments in digital initiatives today, and discover the drivers of technological innovation and integration through the eyes of leading industry experts. 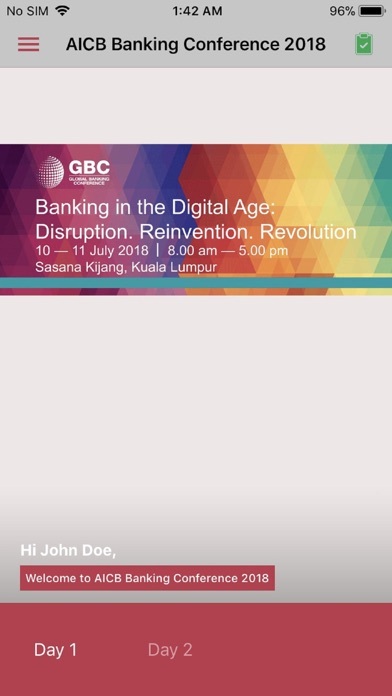 The future of banking in Malaysia hinges upon the ability of its professionals to embrace, internalise and drive change in the digital sphere, and institutions that place digital strategy at the core of their business will thrive in an environment where change is constant. The digitalisation of the financial sector is no longer optional — it is essential.